In this chapter, we reflect on feminist expertise and knowledge in relation to feminist engagement with the broad field of international development and development institutions, in particular. Gender mainstreaming is one prominent practice of such feminist engagement, and we look at it as a primary vehicle for feminist knowledge transfer. Whereas gender mainstreaming envisioned policy transformations and, in addition, societal transformation, there has been widespread disappointment about actual practice not living up to this transformative promise (Eerdewijk and Davids, 2014; Lombardo et al., 2010; True and Parisi, 2013; see also Cornwall et al., 2004; 2007; Sweetman and Porter, 2005; Sweetman, 2012). 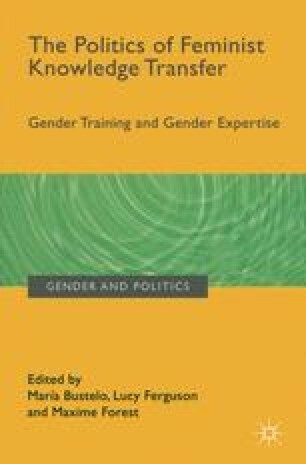 This chapter reflects on how gender and change are conceptualized, framed, and transferred in both the process of gender mainstreaming and in feminist critiques of it. In line with the Introduction to this book, we conceptualize this knowledge transfer as an inherently political and contested process. Its political character becomes apparent in processes of meaning giving that are not neutral, but loaded with power. We conceptualize these power dimensions with the Foucauldian concept of “governmentalities”, in order to capture how they seek to govern conduct, and how this is informed by knowledge, rationalities, and belief systems. We draw attention to how gender and change are not pre-given and stable terms in this process, but are the very site of the political and power struggle over meaning giving.